One of the most useful tools for creating digital line art (i.e. comics!) is the geometric edge tool in Poser 11. It's called the Live Comic Book Preview, and it offers the most versatility of any of the commercial-grade 3D tools that I have tried so far. Just so I don't lose track of it, here's a useful tutorial on how it works. Generally, I don't agree with what he says about lighting, but that's just because he's working in limited color and I work in black & white. 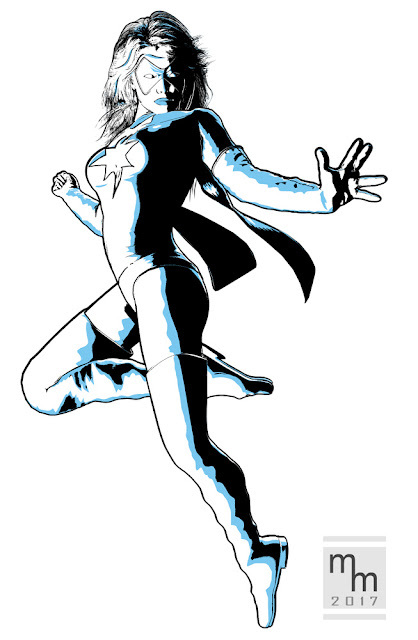 I got a surprising honor today – my "Ms. Marvel - Blue" Illustration was selected by Renderosity as a staff pick of the week! I'm blown away, especially since I considered it to be a minor image, really little more than a doodle. I definitely didn't put the usual amount of work into it. Interestingly, out of the 13 images selected, I was the only working in (mostly) black & white. The topic of computer animation came up the other day, so I thought I would share my personal "epic" film... all 1-minute-7-seconds of it. I made this waaaaaay back in 2002, using Poser 4 (current version is 11). And it took me weeks to sort this out, creating each file separately and then stitching them together. That is, of course, my voice. And the armor clinking was made by tapping a fork on my desk and then syncing it to his footfalls. All in all, a bit of fun from the past. Here's something I doodled up recently using Poser Pro 11's Live Comic Book Preview. I spent more time on it than I should have, but not enough on cleaning up the hair (if I'm being honest). This was just for fun, so I'm not going to worry about those details. All postwork in Photoshop (for a change – if I had planned to complete it, I would have gone to Manga Studio so I could get more control over the linework). Figure is V4, the Ms. Marvel costume is by Terrymcg (he makes a lot of cosplay costumes, many of which can be found for free at ShareCg.com). I wish I could say this was a quickie, and in some ways it was, but I did spend a bit of time on this image. 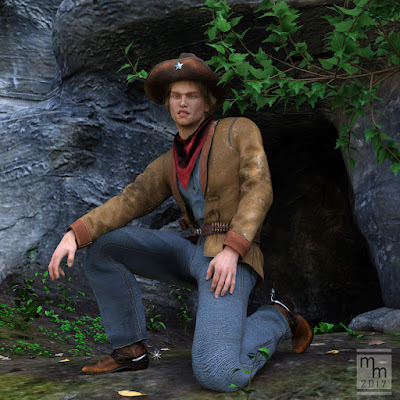 I recently purchased this cool Texas Ranger outfit form Daz3D.com, and just couldn't resist playing with it, even though there is no way this will ever make it to print in any of our books. The primary reason for that is his knees. The textures on this model just stretch, making the denim pattern look absurdly stretched, and the seams at the bend don't fold correctly. This is one of the faults of confirming clothes. That is to say, 3D models that bend with the figure, but don't include soft-body dynamics simulations (or cloth simulations). These are the computations that actually treat the 3D model like fabric, and make it bend and behave like real fabric. Now, don't get me wrong, I'm not disparaging this product, or its creator. That's just the nature of conforming props. They don't bend like real cloth, and that's why I can't actually use it in one of the Western books I illustrate for Hawgleg Publishing. But, this really has a nice texture set and I wanted to play around with it, so here it is. A bit of fun for a weekend (and hey, I got this on sale!). An updated version of this will definitely appear in some future book or project.